I found an original Canon F-1 at a yard sale a couple of years ago by surprise. It was right in the prime of yard sale season and I was in pursuit of old magazines. I sell vintage ads (VintageVirtus on Etsy) and saw a Craigslist ad for “old magazines.” Milling around with a meager $60 in my pocket, I noticed a box with camera lenses sticking out. I slithered over to it, not wanting to look too excited and revealing that my heart had skipped a beat and my palms were starting to sweat. I reached into the 24-bottles-of-beer-sized cardboard box and started rummaging around. I was alone at this point, because this was a very large “living estate” sale spread out in the backyard of a modest ranch-style house. Everyone else was interested in fishing poles, kitchen ware, and lawn tools. One of the first things I noticed was a massive Soligor 500mm mirror lens. Hmmm…I already have one of these in a Canon FD mount…looks like this one is for Canon as well. There were a number of cameras, lenses, flashes, cases, and other accessories, and a large motor drive attachment. It said “Canon” on it and was heavy. 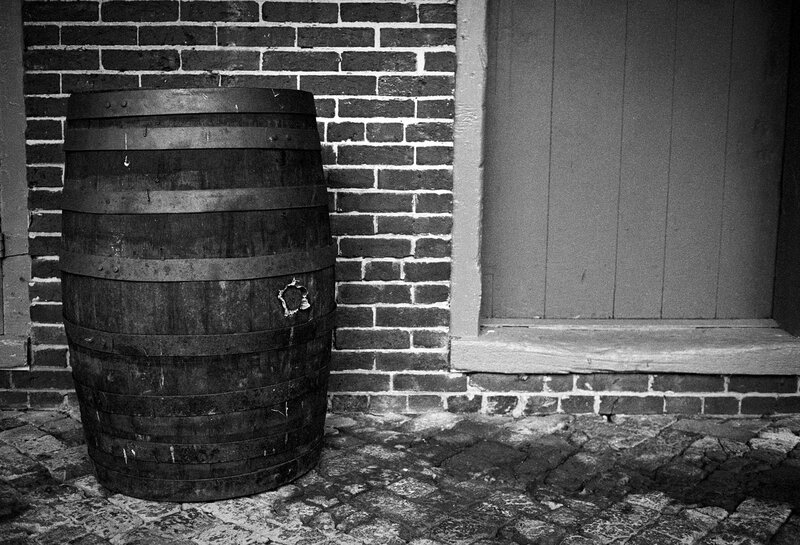 I set it aside and plucked deeper, past a Minolta XG and a few point-and-shoots, to find the holy grail – a Canon F-1. “Sold!” I cried out, not believing my stroke of luck that day. I should have gone to the track! I wound up hanging around a while to find out the history of the camera and how he used it. He bought it second-hand from a friend that barely used it. He liked to photograph his Navy ship models. He was in the Navy for years, and took up building small, accurate models of ships. He must have had 200 in display cases for sale. We talked a bit about his model building and Navy days, and then he asked my advice for better lighting of his models. I truly enjoyed my time with the former owner of my camera, but I couldn’t wait to get home and try out my new find. I did an initial cleanup of the surface, fully expecting a layer of grime and pockets of ashes from his stogie. The first good sign was that it was surprisingly clean. The inside was pristine, save for the failing light seals. I checked all functions, and was happy to see that everything worked. I checked online to see exactly what model I had, because I’ve always been confused about the F-1 lineup. After research, I determined I had the very first F-1 model that Canon made, approximately 1971. Not a bad thing, but I was hoping for the more modern New F-1 from the 1980s. I stuck a standard SR-44 button battery in it to see if the meter worked. It sprung to life…another good sign. I next loaded what seemed like a carload of batteries into the motor drive. After correctly attaching it to the bottom, it also sprung to life and whirred as I pressed the shutter. So far everything was looking great. I put some exposed test film in, and it advanced effortlessly. Wow, this was a nice camera and in great shape – and it was 45 years old. In fact, after using this camera for a few years, I’ve found it to still operate like new. There’s some minor brassing (not always a bad thing), and someone has adjusted the meter (either mechanically or electronically using a diode) to take modern 1.55V batteries. Many cameras from this timeline use the now-outlawed 1.35V mercury batteries. Modern users have several choices, from ignoring the higher readings a 1.55V battery gives, to adapting 1.35V hearing aid batteries, to modifying the camera’s electronics to take modern batteries. I choose to either a) use a handheld meter, b) use hearing aid batteries with an adapter, or c) modify the electronics with a diode. Each vintage camera requires a different decision. I have fallen in love with this camera. I had often pulled out my Canon FTBn when I was feeling nostalgic. The FTBn is very similar, but is a consumer model. It has a solid build, accurate meter, and just feels good in the hands. (Read this great article that profiles the FTb and F-1). My love for the FD line of lenses has driven me to acquire several older Canon cameras to shoot with. I landed an A-1 about 10 years ago and tried to love it. I was enamored with the controls and layout, but couldn’t get past the clunky manual metering mode. I stumbled across an AE-1 and actually enjoyed shooting with it more than the A-1. I then found a T-90, which I found almost exciting. I love its multi-spot metering mode, which is similar to the dead-simple Olympus OM-4. But again, I found it a little clunky. I have to remind myself that these cameras came out in the 70s and 80s and were light years ahead of their competitors. I am a mostly manual setting shooter, occasionally switching to aperture priority if I can lock exposure. I looked at the Canon AV-1 but was scared off by its consumer-oriented build. And then the F-1 entered my world. I think the combined pro-level build, the weight, and the ergonomics have won me over. I started my semi-pro career in the 1970s with a Minolta SRT-101, so grabbing metal dials on the top of the camera, twisting rings around the lens, and pushing a mechanical shutter button come naturally for me. Plus, the dead-on meter gives me confidence when out in the field without a handheld meter. The motor drive (Motor Drive F) is competent, but pretty heavy for my style of shooting. The finder is pretty good, but I have a little trouble focusing. I’ll have to seek out a diopter or newer split-prism finder. The film advance is solid and smooth. It has mirror lock-up for long exposures. Mine has the Flash Coupler F, which essentially puts a regular hot shoe over the prism like most later cameras. The F-1 had that awkward rewind-side-mounted flash contact similar to the Nikon F, F2, and F3, so this is a welcome addition when I use a flash. The camera by itself is a little heavy, but I don’t mind that. I prefer some weight to help in steadying my slow shutter shots. That sounds silly, but if a camera is too lightweight, your shaky arms and hands are telegraphed to the camera. A little weight seems to dampen the small movements that ruin photos. Of course too heavy and your arms shake, so this is a good balance. I have to be careful when laying it down, as it may dent the surface I’m setting it on. Lay it down slowly and softly. Don’t worry about the camera, it’s a tank. The match-needle meter is dead-on accurate. It takes a little getting used to though. You don’t see the needle if the light is too low and your speed or aperture are set too high. Don’t panic, adjust the speed and/or aperture until it pops into view on the bottom. The only light the viewfinder gets is natural light via a little translucent window on the top left of the body. They made a light accessory (and about a thousand other accessories) for low light situations. The only other information you get is the speed, again lit by that little window. This is a fully manual camera, which is fine for me. I’ll take advantage of aperture-priority when it’s available, but my basic shooting style is full manual. I prefer to have a built-in meter when shooting 35mm, my speed control on top, and my aperture control around the ring. It’s how I learned, and the F-1 fits. When I’m shooting an unusual vintage camera, like my Zeiss-Ikon Contaflex, a Voigtlander Vitessa, or even my Olympus OM-1,2,4, I have to think for a split second about where the settings are. Not so with the F-1. This may be why Canon stuck with familiar industry standards for their pro line. Which brings me to why this camera is interesting to me. This is Canon’s first attempt at a pro-level camera. 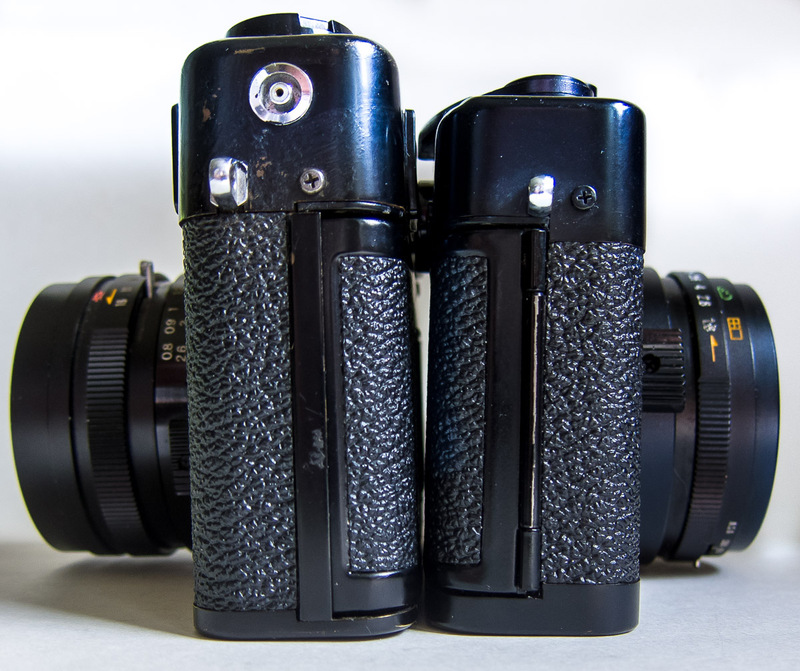 This is before the T-90, the EOS-1V and the EOS-1D. It was Canon’s answer to the Nikon F and F2. It has one of the most comprehensive lineup of accessories ever produced for a 35mm camera. And being pro-level, you get solid build, exchangeable prisms and focus screens, different motor drives and power options, databacks, flashes, lenses, and the list goes on. If I take care of it, I feel like this camera will still be performing 45 years from now. And with the love this cameras gives back to me, I’m not sorry this isn’t a New F-1. Because this is the wise old granddaddy of them all. Here are some pictures from this great camera, all on FD lenses. This entry was posted in Experiences in Photography, Photo and tagged 35mm, analog, camera, Canon, Canon F-1, Canon FD, F-1, film, filmisnotdead, filmsnotdead on October 13, 2018 by kestersonn. One of the main cameras used through the decades of the 40’s, 50’s and 60’s on my Dad’s side of the family. 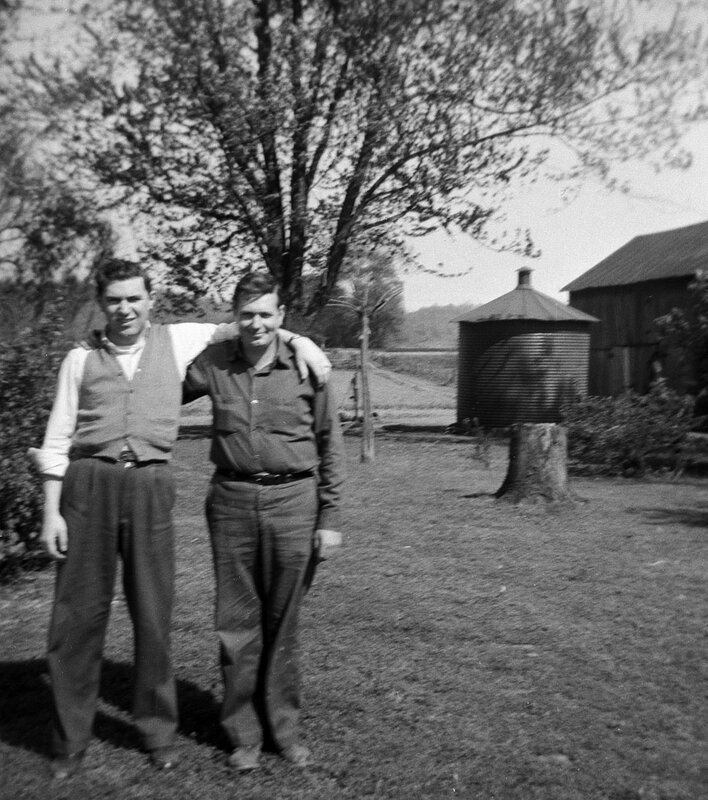 My grandfather later bought a giant Polaroid. He seemed to be one of the few to operate it, as he’s not in most of the pictures. An earlier family camera was the beautiful Kodak Bullet. This is a Kodak Duoflex (1947-50). At first glance, it looks like a simple box or TLR camera. It’s actually a pseudo TLR (a modified box camera with a separate viewing mirror above the taking lens). Just like a box camera, you look down through a double-convex lens onto a mirror. (A TLR would have a matte focusing screen looking onto a mirror, through a viewing lens above the taking lens. The viewing lens would focus in parallel with the taking lens.) But this 620 camera has some unusual features for a snapshot camera. The design is also quite beautiful. There are hints of art deco in the vertical ridges that run from the top onto the face, continuing to the bottom of the box. The ridges are continued on its plastic strap, making it appear continuous from bottom of camera to the neck. The top and bottom of the face are beautifully sloped. It reminds you of a late 40’s Hudson. You can tell from the design, both aesthetically and technically, that Kodak was delivering a stylish camera to the post war consumers who wanted more control over their photography, but weren’t ready to spend a lot. I cleaned up the camera and reassembled it. I shot one roll through it, but I must have misadjusted the focus scale on the lens. I’ll reset that, and maybe replace the pocked mirror before I take it back out. This entry was posted in Experiences in Photography and tagged 620, 620 film, Duoflex, Kodak on December 5, 2015 by kestersonn. 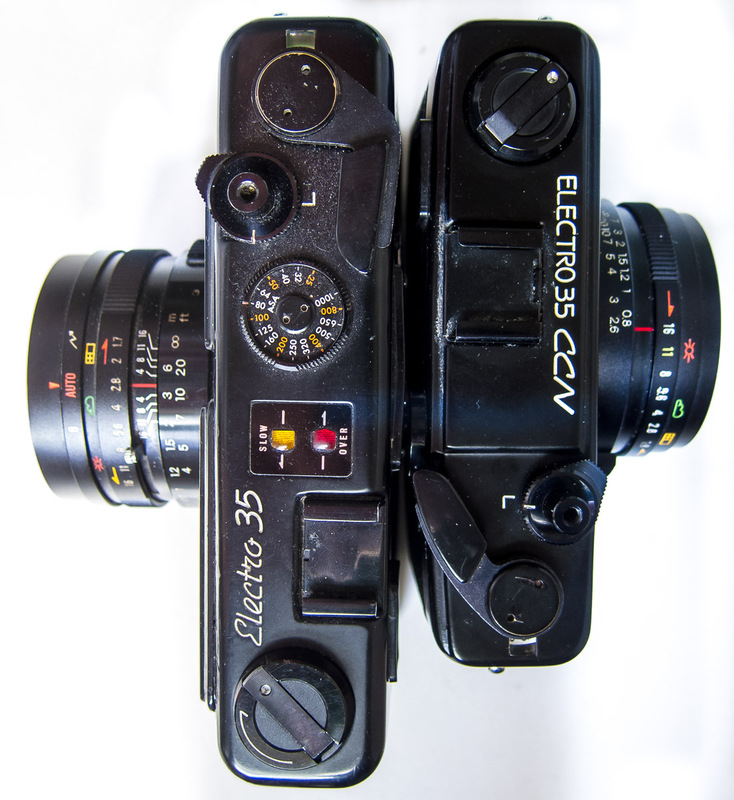 The Yashica Electro 35 CCN is a baby brother to the full-size Electro 35. It’s smaller and lighter, and takes a battery that you can still get at the drug store (I buy bulk batteries at Thomas Distributing and Batteries in a Flash because I use so many odd sizes in my vintage cameras). It’s very easy to carry in one hand, but a little too big to stick in a jacket pocket. I took the strap off mine because it was that crappy stiff plastic stuff that came on so many cameras is the 60’s and 70’s. It has some weight to it because of its metal construction. There are very few plastic pieces on this little wonder. The lens rings are metal and the focus tab is plastic. The top and bottom plates are metal with the film advance lever end being plastic. The viewfinder window frame and the battery cap are plastic. That’s all the plastic on the outside of this camera. Big brother and little brother. The camera came from an “as-is” auction that I got for scratch. I had to do some work on the battery compartment (battery and film left in it for God knows how long.) I took the top off, which was very easy. It was a trick getting it back on because of the battery check button. I wound up holding the camera with its back down, then sliding the top on so the battery button would engage the switch inside. Hard to explain without pictures. 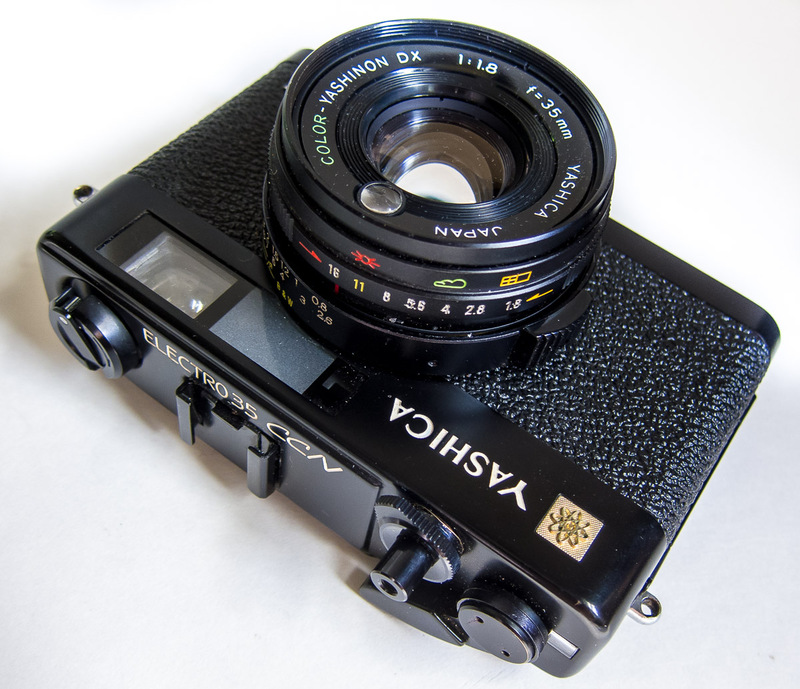 I cleaned the rangefinder glass which wasn’t bad at all, and scraped the battery chamber free of minor corrosion. I made one slight modification the to camera while I had it apart. The film rewind lever was loose and spinning with film loaded. Having never owned a CCN, I wasn’t sure if this was normal, or if there was a bearing worn out that supplied some drag to the wind shaft. So I found a very thin paper washer that I put just under the wind lever that had enough friction without altering the height. Problem solved. 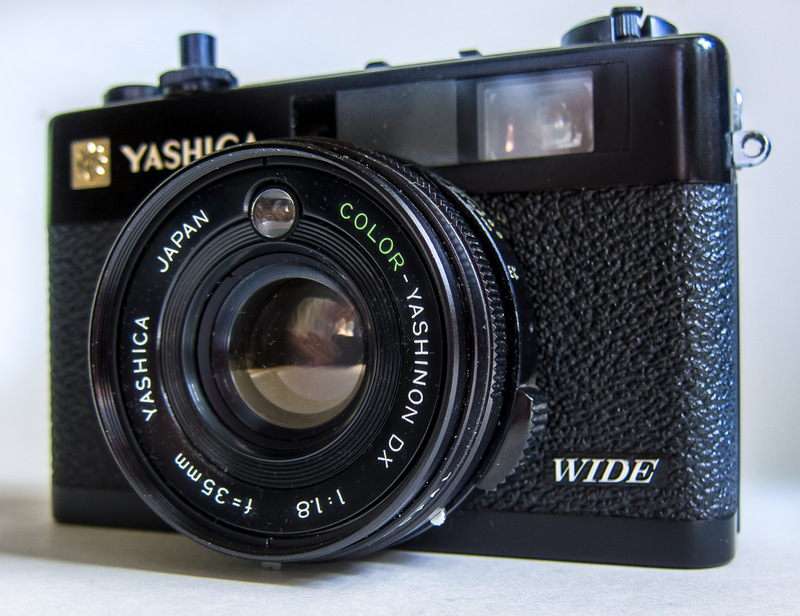 Even though it says “WIDE,” it’s the same focal length as its predecessors. The marketing department probably bought the engineers lunch that day. The CCN has a very sharp f1.8 35mm lens. I’m not sure what f-stop I shot this at, probably f5.6 because it was in the shade near sunset. I like the focal length for this size of camera. It’s meant to be a quick shooter, so a normal 55mm lens would have me stepping back another 6 feet to get the same perspective. Not something you might want to do in a hurry if you’re a tourist. Step back shoot with extra space in the frame and crop in post. Put a second frame line just inside the original frame line indicating where the crop will be at minimum focus. Any focus length between this and infinity will fall somewhere between that crop mark and the outer frame line, The CCN is this way, but not the full-sized Electro 35. Have either the finder mirror zoom, or the frame lines shrink, as the lens is focused close. This gives nearly the exact frame crop in the viewfinder. This is an advanced method found on only a few early rangefinders. It’s considered a luxury for vintage camera shooters. Of my many rangefinders, only the Minolta A-2, Minolta Hi-matic 9, Konica Auto S2, and Zeiss-Ikon Contessa have this feature. I haven’t shot wide open at f1.8 yet, but a few shots were at f4 and looked great. I tried shooting into dappled sunset sun to test the flare, and it looks good without too much wash out. The specs on this camera limit it to casual shooting, which is fine. The fastest shutter speed is only 1/250th, but the fast lens should make up for that. I can’t see sticking a roll of 400 speed film in this camera to shoot in the sun, but cloudy days and indoor shooting should work just fine with that film. All in all, a fun little camera that I will probably always have near the doorway to grab and go. I wish it had complete manual control, but I also wish I had a Leica. For $15, it’s a steal. 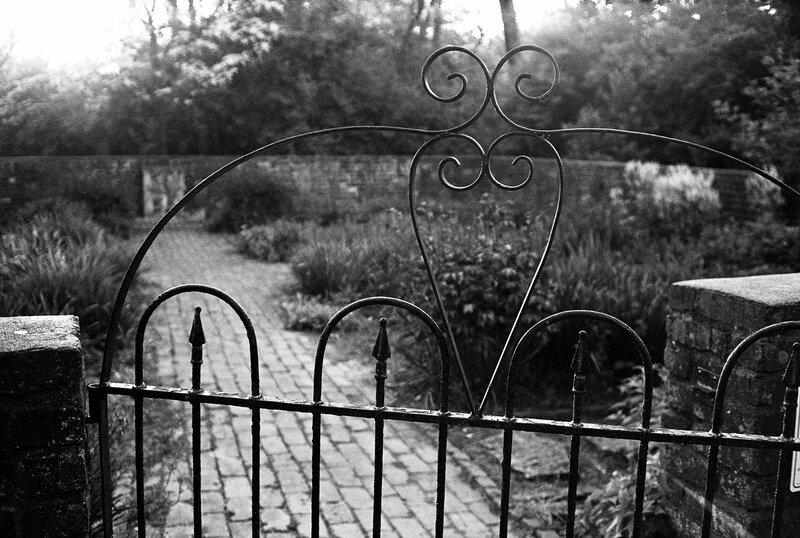 This entry was posted in Experiences in Photography and tagged 35mm, 35mm film, Electro 35, Electro 35 CCN Wide, Kentucky, Lexington, Yashica, Yashica Electro 35 GT on May 9, 2015 by kestersonn. An interesting find while going through boxes and boxes of pictures from my late aunt’s house. There were several negatives tucked away in this envelope. It’s hard to tell when this is from, but from the distinctive Art Deco font and the negatives inside, it was probably pre-WWII. 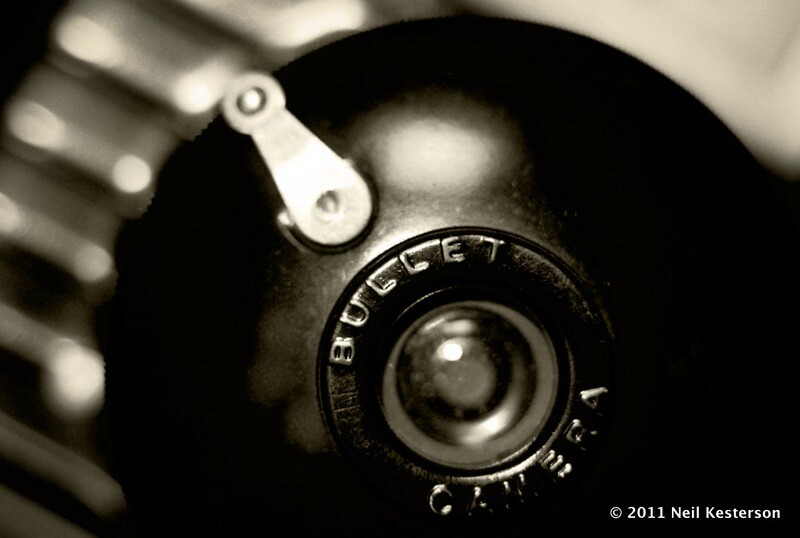 Without getting into a digital vs. analog debate, many young photographers that only know digital may not know what this is. It’s a paper holder for your prints and negatives. The corner drug store was a common place to have your film developed until only about 5 or 10 years ago. 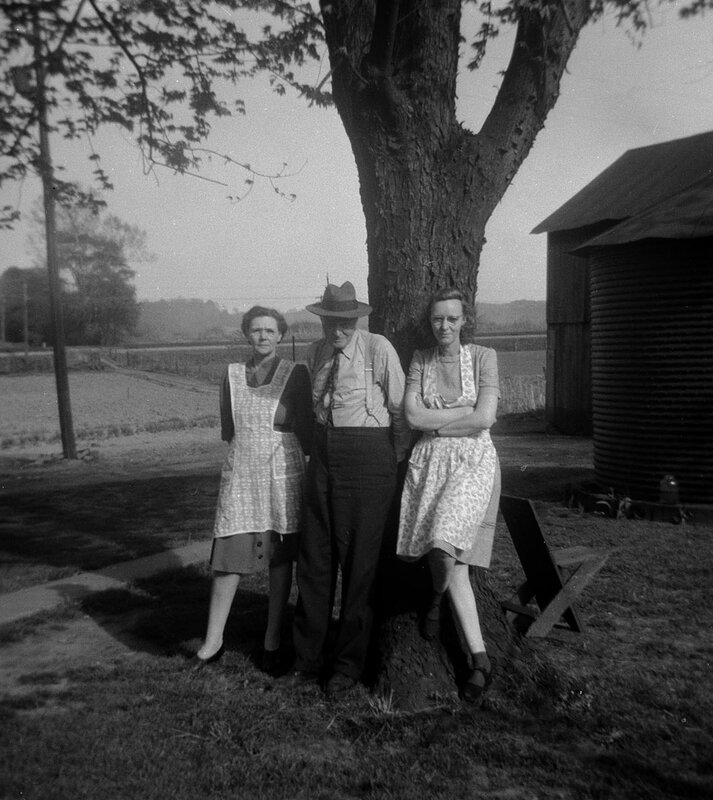 What’s amazing is that the 75-year-old negatives inside were in near-perfect shape. I scanned them all and saw pictures of family members long gone that I have never seen. 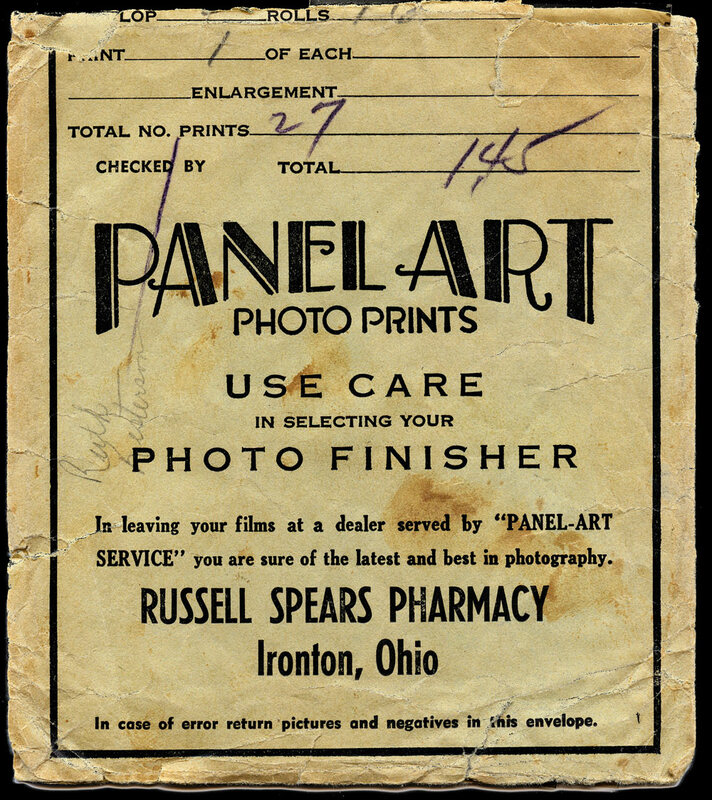 I wonder if anyone will be able to recover digital pictures 75 years from now? 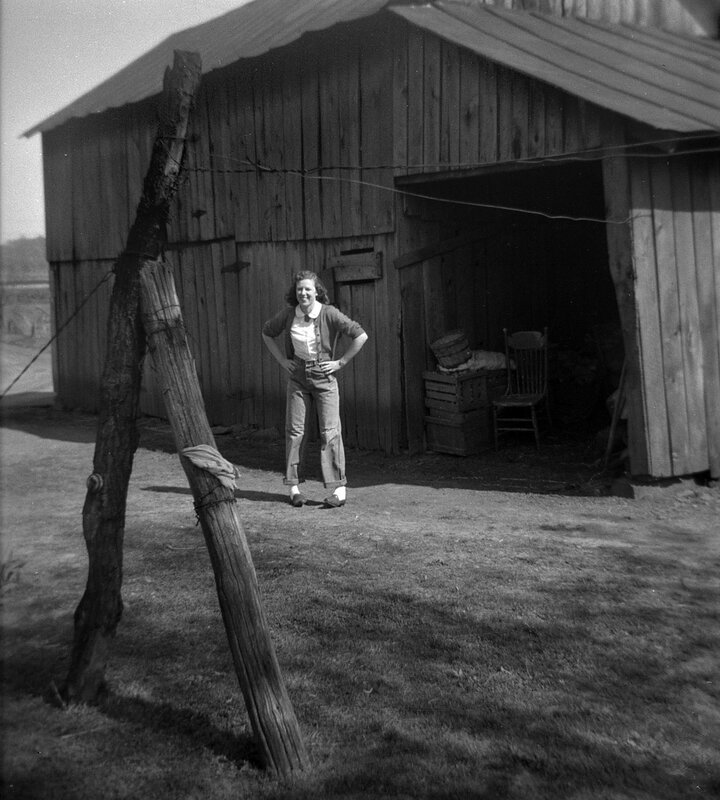 This entry was posted in Experiences in Photography and tagged archives, black-and-white, family, medium format, Ohio, restoration on March 8, 2015 by kestersonn. How I wish it were in France, but central Kentucky is a great consolation prize. For those of you outside Kentucky, it’s not pronounced “Ver-SIGH-ee.” It’s “Ver-SAILS.” Also nearby are Paris (PEAR-us, not pear-EE) and Athens (AEE-thens, not ATH-ens). 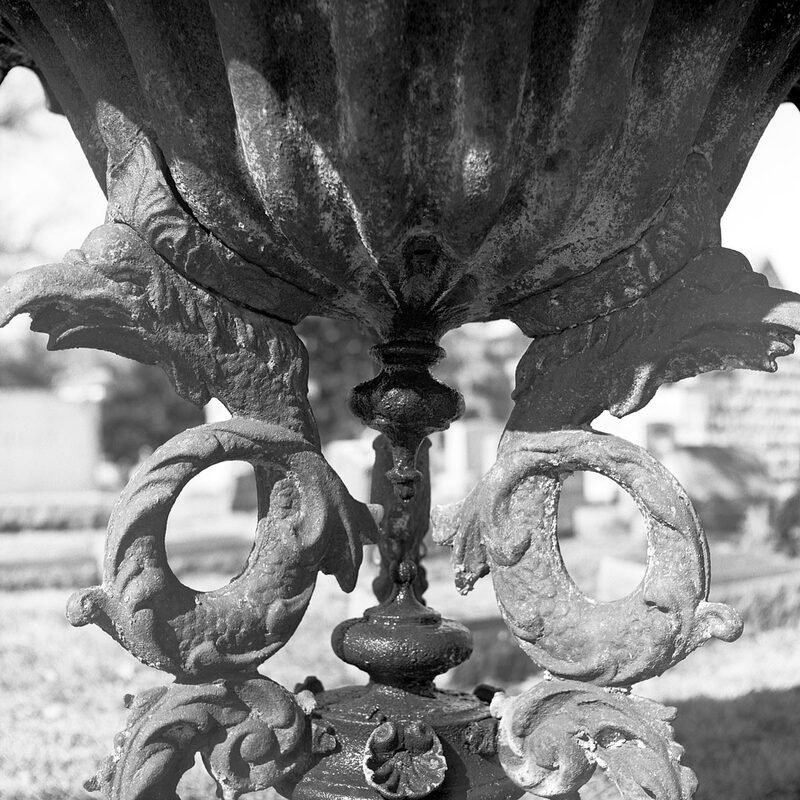 Took the Yashica-12 medium format 6×6 roll film camera and a roll of Neopan Acros (Fujifilm) to try. I’m trying to learn new exposure and developing techniques. Today I wanted to try exposing for shadows and making development adjustments to bring out more detail in the shadows. For the Acros, box speed is 100, so I rated it at ASA 50. On every shot, I metered for shadows using a spot meter, then increased exposure by 2 stops. 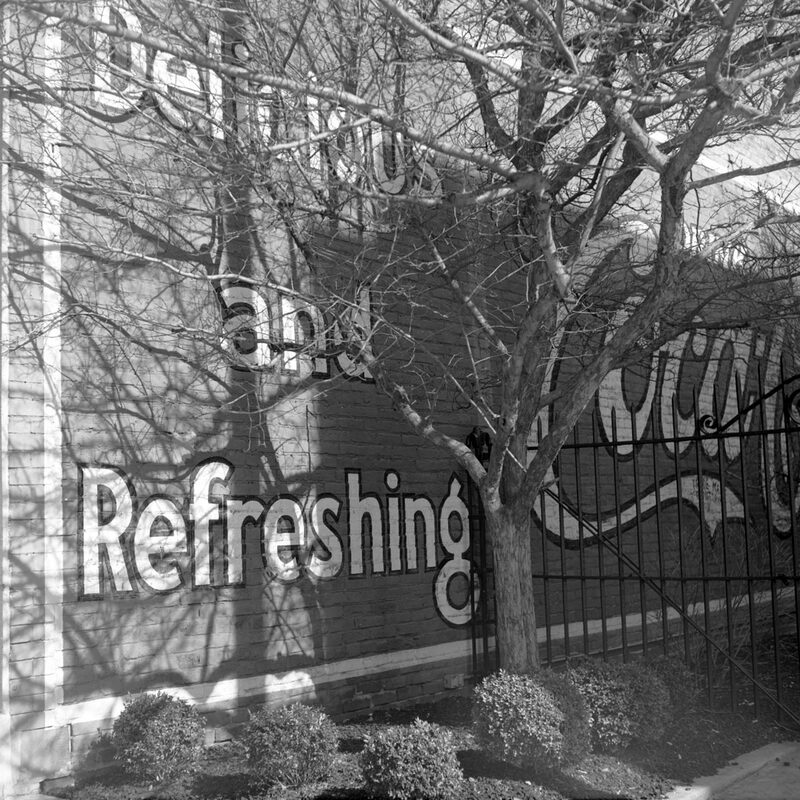 When I developed in Ilford Perceptol at 1:3, I reduced development time by about 20%. From what I’ve read, this keeps the highlights from blowing out. I have to say that it works. It allowed me to decide what kind of detail I wanted in Photoshop. It’s very similar to, if not exactly like, using the zone system to control contrast. By metering for the part of the scene where you want to retain detail in the shadows, you are essentially placing that in zone III in a 7-zone system. Your camera meter is searching for medium 18% gray, or zone V in a 7-zone system. If I would meter for the shadow detail and not increase exposure, then that shadow would be medium gray and the highlights blown out. The opposite is true when metering bright subjects like snow. The meter is looking for gray, so it will reduce exposure to make that snow gray and block the shadows. Ansel Adams’ trilogy on photography outlines the zone system and previsualization. By anticipating where tones will be in a picture before the shutter is released is a powerful skill. But Adams’ system encompasses 9 zones, which are perfect for large format photography. But I shoot 35mm and medium format, which has less contrast in enlargements. Plus, I’m not a professional and can’t distinguish such minute changes in shade. I base my view of the zone system on one proposed by Carson Graves in his book The Zone System for 35mm Photographers. This book opened my eyes to the zone system. I had read Adams’ books on it, but it never totally clicked until I read Graves’ book and tried his technique. I suggest you get it (used ones are really cheap!) and try it. 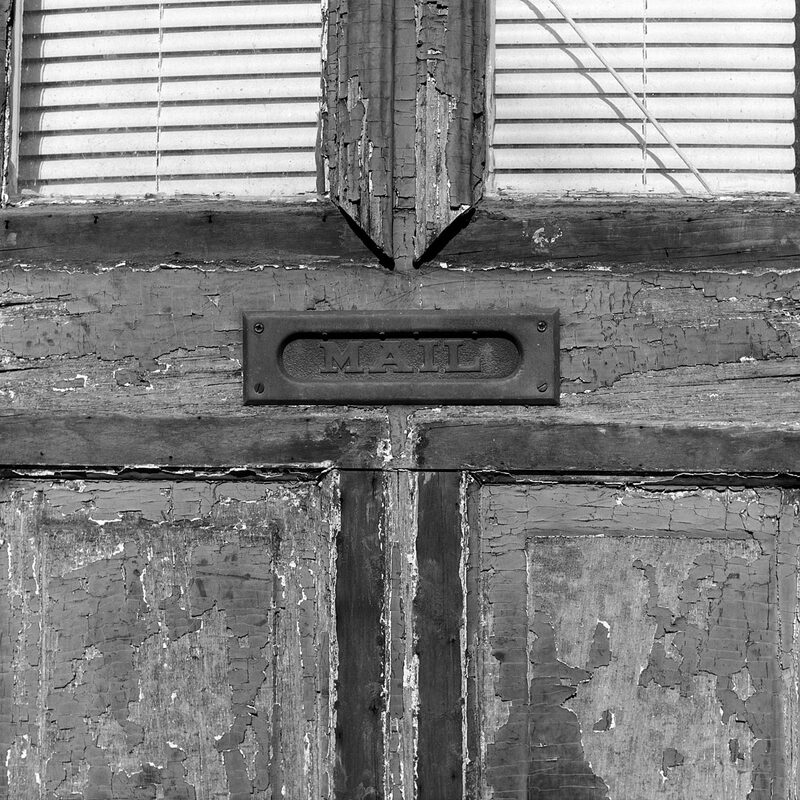 This entry was posted in Experiences in Photography, Photo and tagged 6x6, Acros, black-and-white, Bluegrass, Fujifilm, Ilford Perceptol, Kentucky, Versailles, Yashica, Yashica 12, Yashica TLR on March 7, 2015 by kestersonn. I was on a video shoot about PDR (Purchase Development Rights) land in Fayette County (Lexington), Kentucky. These are lands that are protected from urban development in order to use the land for agriculture, cattle, horses, and even tourism. 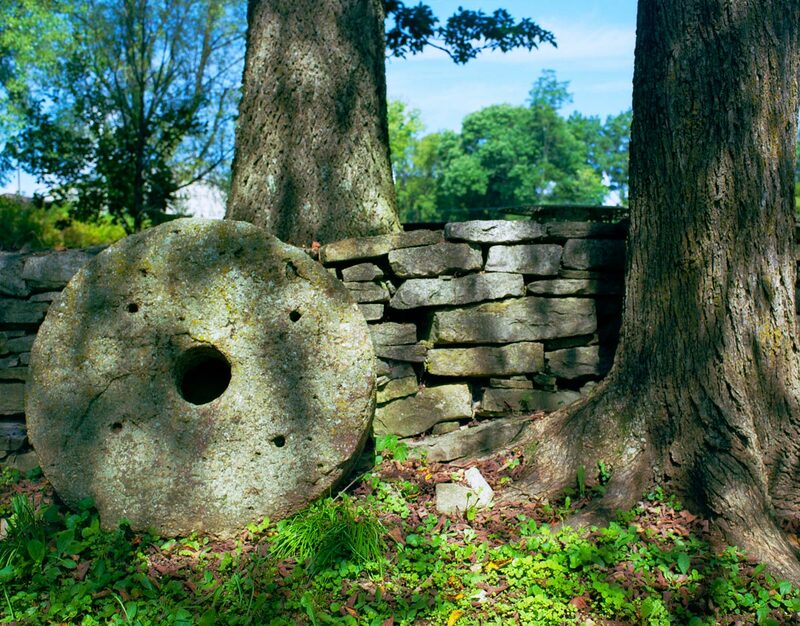 It costs a lot of money to purchase and protect our disappearing landscape in central Kentucky. We were shooting on the property of Grimes Mill Farm that borders Madison County near I-75. 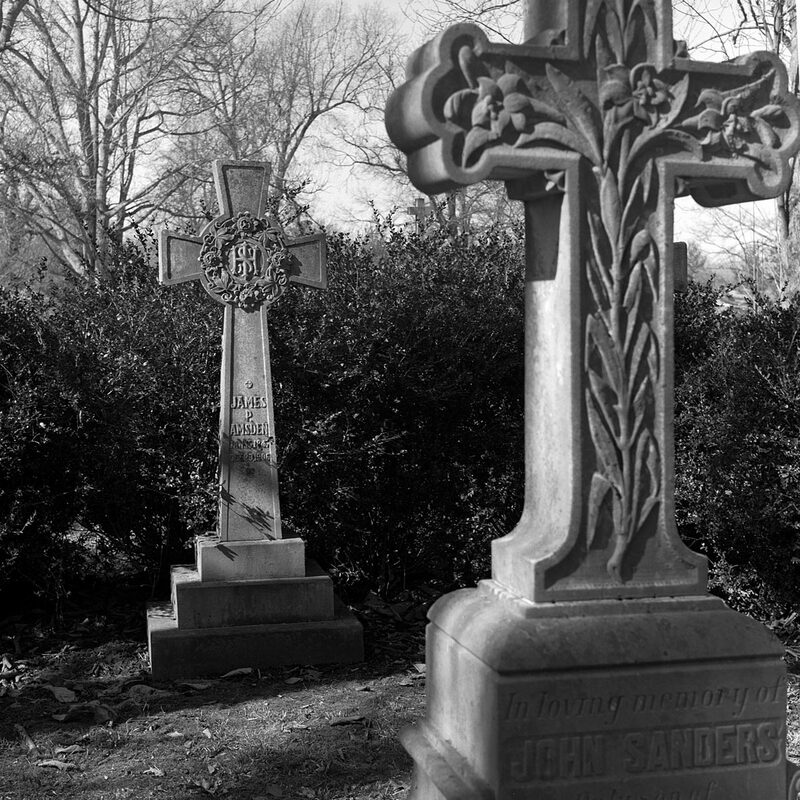 The featured image was shot this with color film, though I envisioned it in black-and-white. It was mid-morning (and extremely humid! ), and I was fighting the dappled sunlight. But it was my only opportunity to shoot these. 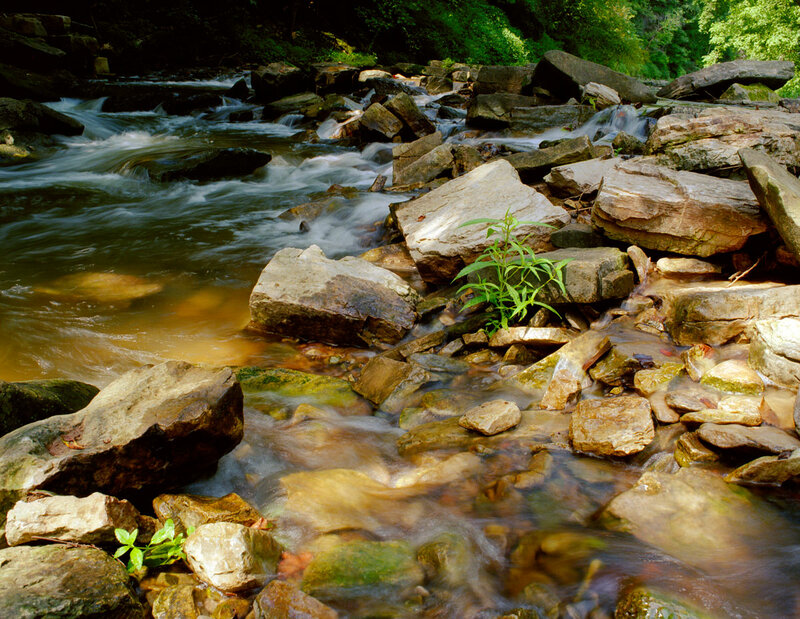 I think the dappled light actually works with the Boone Creek shot. I like the brown water highlights and the light on the trees in the background. It helps the depth. This entry was posted in Experiences in Photography, Photo and tagged 120, 120mm, Bronica, Bronica ETRS, Ektar, Ektar 100, film, Kentucky, Kodak, Lexington, medium format on November 2, 2014 by kestersonn. Shot on the massive Soligor 500mm F8 mirror lens on my Canon T-90. 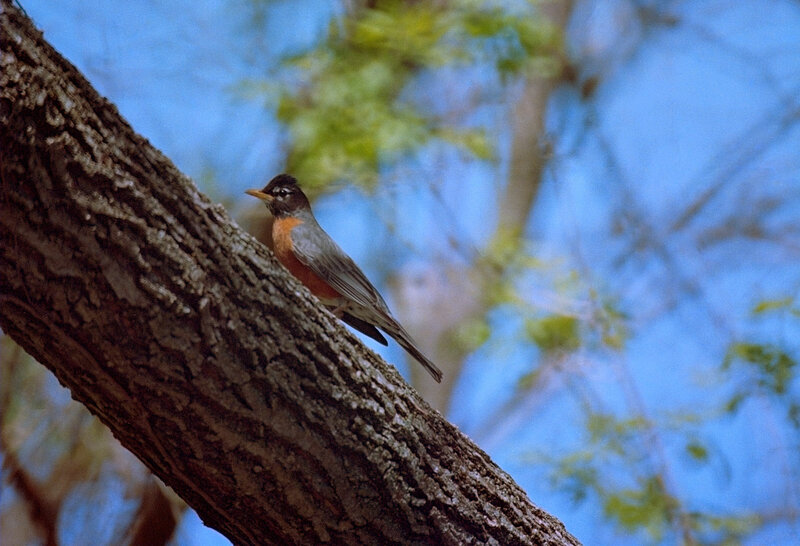 Not the best picture of a bird, but notice that the background doesn’t have those out-of-focus rings that are characteristic of mirror lenses. It seems straight lines minimize the effect. I actually don’t mind the rings in some shots, but other times it distracts from the subject. This entry was posted in Experiences in Photography, Photo and tagged 35mm, 500mm, Canon, Canon FD, film, Kentucky, Kodak, Lexington, mirror lens, Portra, Portra 400, Soligor, T-90 on August 9, 2014 by kestersonn.